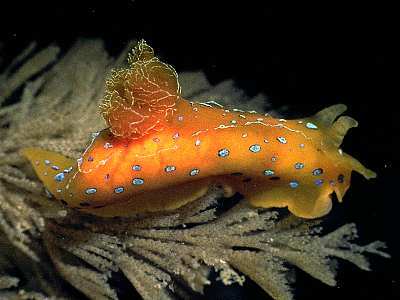 Description: This distinctive species is orange in colour with brilliant blue iridescent spots. The gills are robust with iridescent blue-green lines along their ribs. The head may bear up to 22 finger-like processes. The maximum recorded length for this species is 48mm. Habitat: G. elegans feeds preferentially on the Bryozoan species Bugula turbinata but has also been reported to feed on other species of Bugula. Distribution: Records of this species are from Kilkieran Bay, Co Galway; Sheep Haven, Co Donegal; Skomer Island, Pembrokeshire; Lundy, South Cornwall and the Mediterranean. 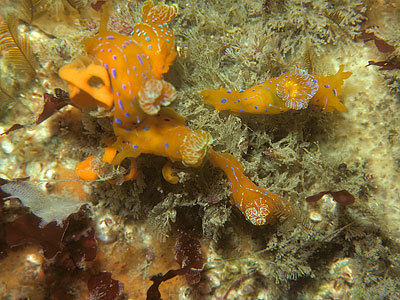 Similar Species: The spectacular colour of this nudibranch readily distinguishes it from any other in the British Isles. Orange coloration with large iridescent blue spots. Rhinophores and gills without sheaths or accessory processes. Picton, B.E. & Morrow, C.C. (2016). Greilada elegans Bergh, 1894. [In] Encyclopedia of Marine Life of Britain and Ireland.